Starting next month, anyone who believes the gender pay gap has negatively impacted their earning potential can pay a discounted price for museum admissions. The new policy coincides with the opening of a traveling Laurie Simmons exhibition. 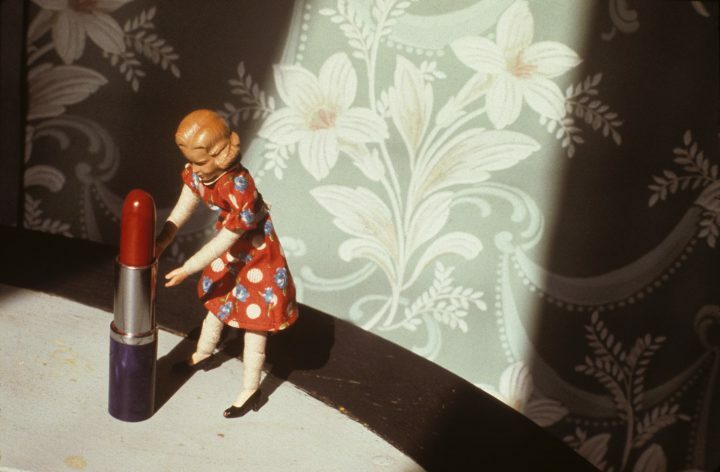 Laurie Simmons, Pushing Lipstick (Spotlight), 1979. Photo: © Laurie Simmons, courtesy of the artist and Salon 94. In the US, the average woman worker makes around 81 cents for every dollar earned by her male counterparts. (The gap is even more drastic for Black and Latina women.) In an effort to call out this disparity, the Museum of Contemporary Art in Chicago is lowering its price of admission for anyone who believes the gender pay gap has negatively impacted their earning potential. Starting February 24th, visitors will have the option to pay $12 for tickets — 81% of the full price of $15. The new admissions policy coincides with the opening of Laurie Simmons: Big Camera/Little Camera, a traveling retrospective of the renowned feminist photographer’s work. MCA director Madeleine Grynsztejn proposed the idea for discounted tickets, and curator Naomi Beckwith announced the new policy at a preview for Simmons’s exhibition. This admission policy will apply during the run of the Laurie Simmons exhibition, from February 23 through May 5, 2019, in honor of the artist. Such efforts do more to draw attention to systemic sexism than to provide meaningful financial assistance to underpaid women, of course, and often read as corporate feminist publicity stunts. While it’s unclear whether these gestures contribute to real progress in the fight for equal pay, they certainly contribute to social media uproar — in some cases, men have claimed that being charged more than women amounts to a violation of their human rights.